Today we’ve got an interesting startup to go over. 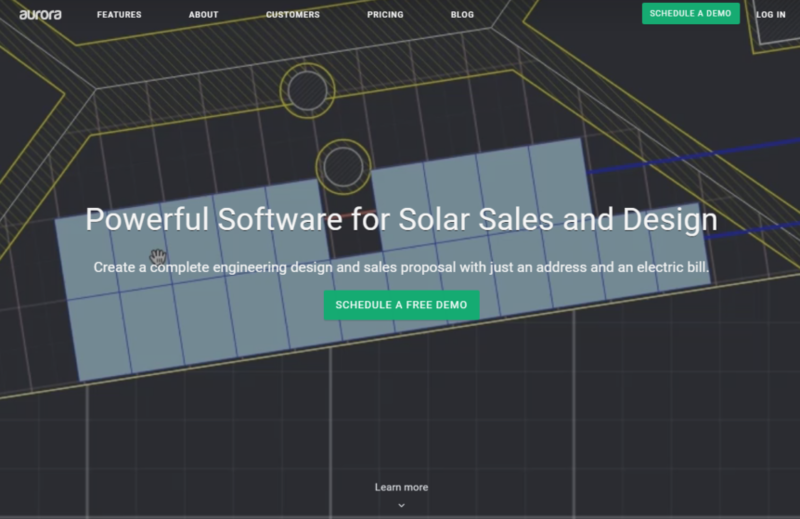 Their name is Aurora Solar and they recently made a splash in the news for raising a $20m Series A round. I gave this Techcrunch article a quick read and poked around their site a bit, and I must say, I’m impressed. The value of their product is obvious. They do a great job explaining it. And their product-market fit seems rock solid… mostly because they designed the product for the market. At first pass, I suspect the next phase of their growth lies more in product/channel fit than anything else. The hundred million dollar question is, what are the best growth channels to pursue? Before we get into that though, let’s go over some metrics and tools I was able to find on their site. Similarweb shows their monthly website traffic to be right around 100k visits/mo. Fantastic. A few of these are redundant, so I’m guessing they’ve cycled tools after experimenting a bit. That’s great to see. The key takeaway from this list is that they’re using a lot of the right tools, and have a quite modern marketing team. That’s good. They also buy into inbound marketing, evidenced by their use of HubSpot. This reflects in their strong content marketing efforts. I think this is going in the right direction and they should double down on this channel in 2019. Another takeaway from these tags is that they’re probably running ads on Google Ads, LinkedIn, Facebook, Pinterest, and Reddit. I also think that’s the right move. This is overall a great base of marketing efforts and tools. That’s the rough overview of all the data I gathered in a 15min pass. So, let’s get into some channel ideas and suggestions. I also have a few recommendations on their website. They have a nice library of video content to advertise and should definitely take advantage of this. I’d like to see keyword targeted Youtube advertising for similar keywords to what they’re targeting via content marketing and Google Search Ads. Video ads are cheap and can get massive reach. This would be a great cost-effective way to spend their new capital and reach large audiences. This is a powerful tactic I first heard on The Art of Paid Traffic, a great podcast to check out if you haven’t heard of it. You set up a Facebook audience as A) a lookalike audience to your customer/lead list, and B) a retargeting audience based on your site pixel. From there, you target the whole audience with a very top-of-funnel video, designed to hook interested people in your audience. A customer story, or industry expertise clip for example, would be great here. Next, you set up a video engagement audience based on only people who watched more than 50% of your first video. Target this audience with a video further down the buyer’s journey. For example, case studies and testimonials. Next, you repeat with a 50% engagement audience off of that video. Send this third audience a bottom of funnel video like product demos and example use cases. The goal with this tactic is to use video audiences to walk people through product education and qualify your audience. I didn’t notice a pixel for retargeting tools like AdRoll or PerfectAudience. They might be running Facebook retargeting natively, but either way I’d want to branch out to a retargeting tool that also includes wider inventory and display targeting. I suspect they are already running these based on the pixel I found. Definitely keep this up. I imagine their target persona(s) are keyword and job-title targetable. Any time LinkedIn is a viable channel, it’s a good bet that outbound email is a lower-cost variation on this. Guessing they are already running ads here as well. Their content marketing is top notch and is clearly working based on their website traffic. Only thing to do here is keep it up or double down on output. I suspect this industry has a lot of high quality conferences and events. Solar panels are tactile, physical goods. Trade shows for manufacturers and suppliers seem like they would naturally crop up. Any event like that would be perfect for these guys. They should sponsor, buy a booth, throw afterparties, try to get the email list, etc. on all events in the industry. Betting big on ROI here. Community building. For solar installation companies and contractors – Facebook for sure, maybe LinkedIn. I think there’s a lot of value to be unlocked if they can build an owned community that helps installers and contractors build their businesses and learn from each other and experts. Improve pricing strategy – I’m not a fan of two tiers and a nebulous Enterprise level. There also isn’t any kind of variable unit to increase revenue per customer/user. A good example of this is Hubspot. They charge a base amount per month for the software, upsell you on feature adds, and rate charge you on contacts in your database. I think these guys could take a page out of our boy Tom’s SaaS pricing strategy and up their pricing game. Of course, we all know that higher ARPU and LTV means higher acceptable CAC costs… which is a major growth level on the front end and the back end of customer acquisition. OK. All that said, let’s move on past channel strategy. Here’s a brief list of some things I think they could improve on their website. Special emphasis on TOFU and MOFU content offers to better capture leads, educate buyers to move them down the buyer’s journey, and give their sales team more to work with. Align demo CTA with webinar offer on the form page. Currently mismatched. Add TOFU / MOFU content offers and lead magnets to better utilize HubSpot. It appears that all CTAs currently drive to demo. Their leadership team should first work on pricing strategy. This is the biggest growth lever I see as they scale because it allows for a wider range of acceptable lead gen strategies. It’s a good idea to tackle this now so the marketing team can make go/no-go decisions on channels and campaigns. After that, I’d like to see effort on lead magnet development in their content marketing. This dovetails into email automation as well. I would really love to see more advertising on their video content. It’s cheap, it scales to big audiences, and they already have the content for it. At this point, it’s all about running rapid experiments and testing channels and ideas (like the ones written here). There’s not really a huge opportunity missing that I can see. They’re doing all the right things. It’s just a matter of doing more and iterating faster.